This entry was posted in Follow the Money, Uncategorized and tagged CGT, Follow the Money, FSI, land, property tax by Alex Cobham. Bookmark the permalink. The first is that the UK is not moving to full blown non-resident CGT as other jurisdictions have, not even just on the property, let alone tracing through into shares. So knowing that Mr Richard Tator of Ruratania is the beneficial owner of a UK property held via BVI entity does not change the fact that it would not give rise to UK CGT if he disposed of the shares in the BVI entity and may not even give rise to a tax charge if he owned it directly and sold it. Pest divorce case caveat here as to whether BVICo Ltd was a nominee. In Ireland any shares deriving the greater part of their value from Irish land are subject to CGT regardless of the location of the disposer (2 DTAs aside). The practical element to this is that Ireland has a CGT withholding for such shares and thus e.g. a large property fund as vendor cannot ignore it, without a clearance certificate they must withhold out of the proceeds and remit it to Revenue. The issue with that route (from a tax justice point of view) is that both the Dutch and Luxembourg DTAs restrict Ireland’s ability to tax if a double holding structure is used i.e. Luxco 1 owns Luxco 2 which owns the land and if Luxco 1 sells Luxco 2 Ireland can’t tax that. The UK has a similar issue with your Luxembourg treaty meaning that even if you moved to full non-resident CGT you might expect to see your investment into real estate coming in via Luxembourg as ours does. Generally if you’re looking at tax avoidance you’re looking at EU jurisdictions with tax treaty and other protections, if you’re looking at secrecy jurisdictions then if there is a tax issue it is more likely evasion than avoidance (or very racy avoidance that might be at significant risk of failure). Transparency and tax liabilities don’t necessarily mesh in quite the way you’ve outlined above if that makes sense. But you want to think about SDLT as well as CGT. Offshore envelopes like BVICo above could give rise to savings there, and while changes and ATED make it less attractive than it once was, they have limited impact on existing structures and a lot of EU jurisdictions levy transfer or wealth taxes rendering them less attractive. Many thanks, Aisling. I take the general point – “Transparency and tax liabilities don’t necessarily mesh in quite the way you’ve outlined” – to heart. 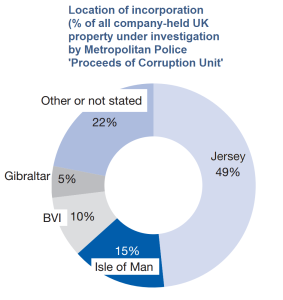 In particular, that the UK system at least continues to privilege, subsidise, encourage offshore ownership – over and above any more dubious benefit derived from opacity. Laying this out to public scrutiny through greater transparency seems likely to be of clear benefit. We can agree to disagree as to whether it is always nefarious but certainly there is pretty broad international precedent for your rules going further than they have in relation to non resident CGT. I do struggle to think of legitimate policy reasons to allow the disguising of beneficial ownership other than maybe in cases where a politically motivated expropriation may be at issue.